As mentioned in a previous post, I’ve been working on a frequent service map of Montreal’s new réseau 10 minute max (10 minute network). Just a couple of days after the new schedule went on effect on August 30th, I am now publishing this map (under cc-by-sa-nc). The stm also published a map. But theirs is basically just the full system map with the whole system (except the metro) removed and the frequent lines added in thick lines — it’s still a huge map (because it is geographically accurate), for a relatively simple system. Also, the lines often sit on top of the metro lines, so it’s hard to read. 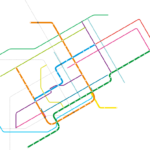 I wanted to make a map that is similarly abstract as the old metro map, to show the similarity between the frequent service network and the metro system itself. Both should be accessible without needing any schedules, or knowing the area well where one is travelling. I wanted to combine the simplicity of the traditional tube map with the look and feel of the Montreal metro map (and the new stm designs) while adding in the frequent bus lines – and all that in a letter format. The result is indeed letter sized (with 5mm margins), and designed to fold twice (along the legend boxes), albeit with some pretty small fonts. Nevertheless, it should be possible to carry this map along all journeys much more easily than the whole system map — this independence is sort of the intent of the original London tube map, and also of the new frequent service network. I added the commuter train stations on the island of Montreal, something that the metro map doesn’t show. 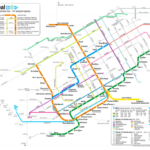 Although they don’t run frequently, the connections are good to know and an imprtant aspect of the public transportation network — so they are shown in greyed out, dotted lines. I also added the airport express bus, even though it runs at a lower frequency than 10 minutes, because of it’s success and general importance. The legend shows that it runs less often. The stm chose a system of 11 lines with 10-minute frequent service running form 6am to 9pm, and a set of 19 lines that run frequent in the downtown direction from 6am to 2pm, and in the opposite between 2pm and 9pm. These lines don’t qualify as all-day frequent service, so they are also shown greyed out, with arrows indicating the morning/downtown direction. I assigned colors to the all-day frequent lines as if they were metro lines, based on the sort of pastell color theme of the stm. A feature that is not even in the full system map is the indication of all stops along the bus lines. While I didn’t actually name any, it still provides useful information – it gives an indication of how long it takes to traverse a certain route (the more stops the longer it takes), and it gives an idea of how many stops it takes to go from one intersection to another. The one should help people to be more independent of schedules by being able go estimate how long a trip will take, and the other helps people to navigate the city riding the bus without knowing a certain area. Both are intended to lower the barrier of entry for new users (or users new to an area, or tourists) to be able to use the bus system. 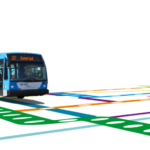 A focus on usability in public transport systems (especially buses) is sometimes lacking, but attempting to create user experience similar to a metro system should help attracting riders. This project was partly inspired by Jarret Walkers treatment of frequent service ideas over at human transit. Most of the above links direct to his discussions of the topic. I have also taken a closer look at the bus network. Check out the most recent update. Filed under buses, map, Montréal, scheduling. I should point out a small spelling mistake in the legend: “résau” is spelt “réseau”. fixed stuff, put up pdf. My daughters are in cegep and university and both complain about the lack of services in the West Island. That’s really obvious in your excellent map. It’s a wonderful map. 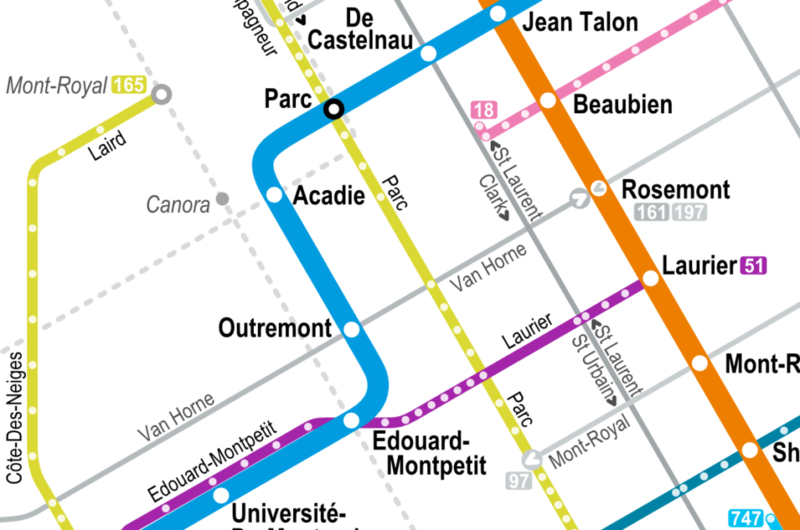 I wonder if the STM will start to increase the stop spacing along the frequent network to speed up service, as the stop spacing is quite dense in some areas, as evidenced by your map. I once managed to catch an 80 bus by running from Sherbrooke to New Rez, and while the stop spacing (and the average speed that follows) was helpful right then it means that the frequent network will be frequent but not particularly fast. Having said that, may I point out a few spelling mistakes: Du Collège, Université-De-Montréal, Jolicoeur, Montmorency, Baie-d’Urfé, Longueuil, Champ-De-Mars. 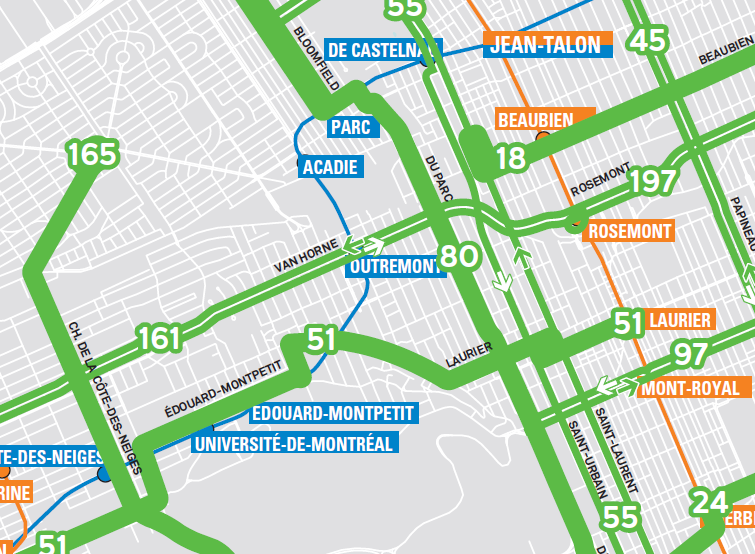 I think some kind of note about the 535 would also be in order (I recognize its run along René-Lévesque, but map users coming to Montreal for the first time might not). Thanks for pointing out the mistakes, I updated the map. I am not sure how to mark the 535 yet; so far I only put “Cote-des-Neiges (165-535)” in the legend. I really wish they would simplify this service, special service patterns are really not useful for a frequent service map. I’d like to make a map, as well, for transit users in Metro Vancouver. Which software did you use? I used Inkscape. The svg can be loaded with it. I see a bright future for public transit, now that there are open standards, and things like Creative Commons. Thank you, this is a beautiful and useful map! My search was for an svg tube map for a beginning point to use in inkscape. I want to make a map of x-country ski trails for our local club. Merci! Thank you! This map is both beautiful and stunningly simple. I do have some food for thought though: some routes run VERY frequently during rush hours in certain directions (infamous example being the 460, which can run as often as every 2 or 3 minutes in one direction, and every half hour in the other), but while incorporating that would technically show more service, it might clutter up the map too much; so I suggest to keep it in mind, but take it with a grain of salt. Another feature might be to further highlight routes that also run every 10 minutes on weekends between 9am and 5pm (or maybe a more appropriate time frame for Sunday, but with the same concept in mind). 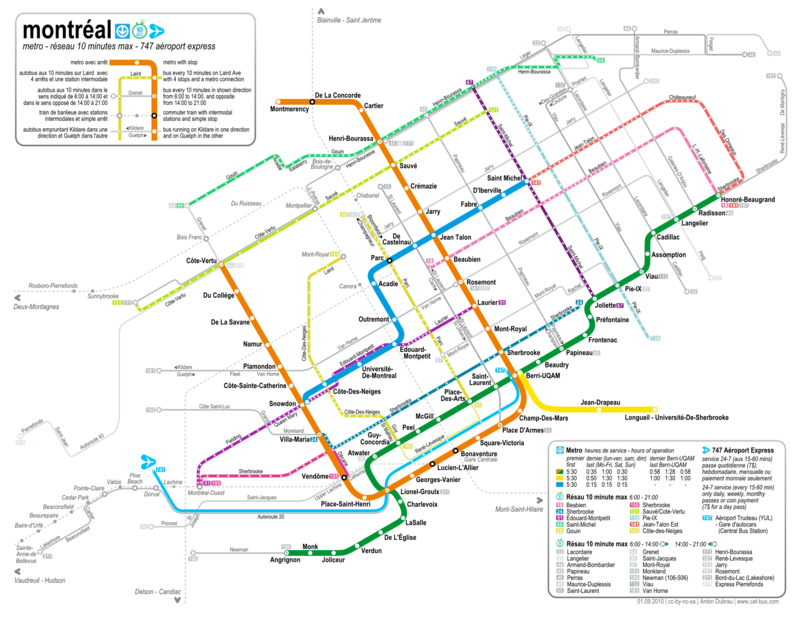 And for those that live and work off-island, to add in bus routes that would theoretically be a part of the 10-minute network but aren’t a part of the STM would be a big bonus, because it would give a more comprehensive network for the entire Greater Montreal Area and add even more legitimacy to your map than there already is. An example could be the RTL’s 45 Express Panama—Centre-Ville, which runs at least every 10 minutes on weekdays in both directions (except from Terminus Panama to downtown between 6:00-6:30am, where it has two buses instead of three, from downtown to Panama between 6:07-6:52am which has four buses instead of five or six, and a 12-minute gap from Panama at 7:00pm; but those are the only discrepancies I noticed, so it might slide, as do some of the STM’s routes that have small gaps here and there as well). Now for a little thing that irks me: the schema that’s given to the 470 is quite deceiving. While, yes, it saves space, it gives the impression that it runs towards the southern shore of the West Island when it actually runs along the northern shore; it often gets confusing trying to use it as a guide, and it can get pretty annoying to make sense of it, speaking both as an amateur urban planner and as an off-island commuter that often drives to Fairview to get to where I need to go by bus. All I suggest is to make some more space between the 470 and the 211 so that it seems that the 470 is actually going west of the Deux-Montagnes train line along Pierrefonds instead of through some strange, inexistent road; a suggestion might be to put the legend between this gap so that you can save space on the bottom of the map, just in case there are other routes from other transit corporations (such as the RTL’s 45 if the “good-enough clause” is enacted). And an actual error now: the 171 runs frequently in the direction opposite of what you have labeled. In the morning, it runs at least every 10 minutes FROM Henri-Bourassa towards Côte-Vertu; and in the afternoon, it runs frequently TOWARDS Henri-Bourassa. It’s actually pretty difficult to make a map with lines all along a 0,30,60,90 degree grid, while showing all the features and keeping relative locations – on a single sheet of paper, and without having lines cross across labels. The West Island got completely crushed in the process. The reason the 470 looks funky is because it runs on St Jean, which is also where the Cedar Park commuter rail is. I am thinking about crushing the East a bit more to make the West more ‘accurate’. I’m looking into the 171 issue as you mentioned. 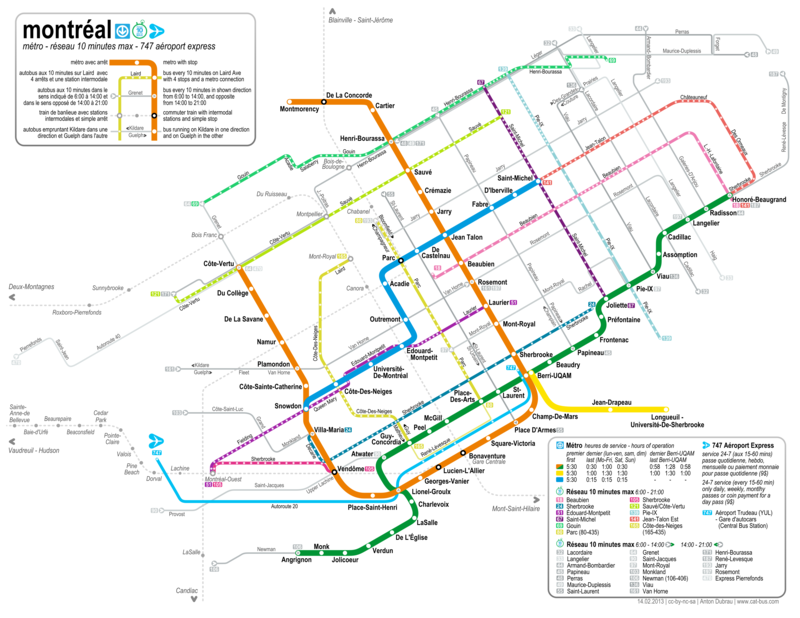 Somewhat similar to your “fantasy map”, how conveniently forgotten is the once-proposed Metro map of 1976 (and later in 1978) as outlined in the official publication “The Montreal Metro” published by the Communaute Urbain de Montreal and registered in the Montreal Library as Catalogue No. 388.42 C734meL. Subsequent editions of “The Montreal Metro” omit the aforementioned plan. 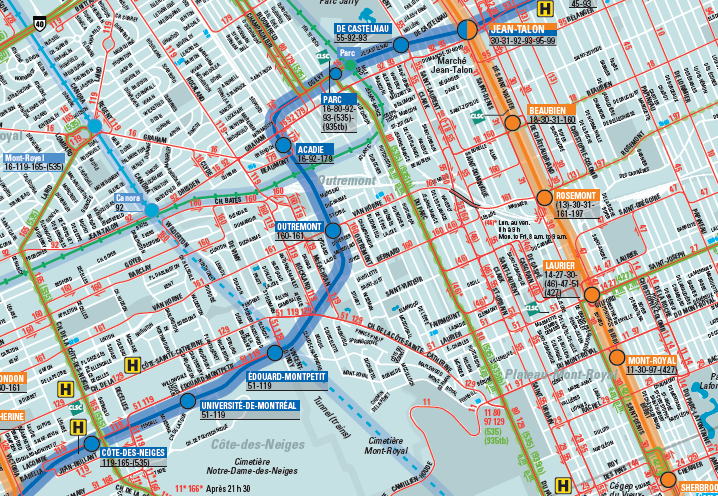 Notice that this map (see attachment), among others, includes a western extension of the Blue Line from Snowdon to additional proposed Metro stations named Cote St. Luc, Cavendish, Montreal West, and Lafleur. Utilizing a magnifying glass, a rudimentary analysis of this extension seems to indicate that the Cote St. Luc Metro would have been located approximately near the corner of Cote St. Luc Road and Girouard, the Cavendish Metro at the northwest corner of Monkland Avenue and Cavendish Boulevard (Benny Park), the Montreal West Metro on the ideal empty lot (a property presumably owned by the City of Montreal) just to the east of the Elmhurst bus depot and conveniently adjacent to the Montreal West AMT railway station, and finally the Lafleur Metro which appears to be located near the corner of St. Jacques and Richmond where the Lafleur fast food restaurant exists (was that someone’s idea of an inside joke?). Other ideas would presumably have extended the Blue Line even further west into Lachine at LaSalle Park at the corner of Victoria and 10th Avenue thereby serving another large and growing residential population. I suspect that all of above would likely have been some bureaucrat’s or politician’s election issue teaser which was doomed from the beginning anyway to come to naught. Needless to say, subsequent provincial PQ separatist governments put an end to such “foolish speculation”; their funding of which would clearly have benefitted the large Anglo population in that sector of the island–never mind that Francophones live there as well. Incomprehensibly, City Counsellor Marvin Rotrand–himself a long-time resident of N.D.G. no less–has consistently been opposed to any western extension of the Blue Line which would serve “his” district and beyond: a line which has steadily become more vital with the increasingly high bus passenger volumes on route 51 to and from the Snowdon Metro station and along the 105 bus route to and from the Vendome Metro station. It is all very well that an eastern extension of the Blue Line to Anjou is long-overdue and necessary and now evidently imminent (as officially announced in April 2018), but a western extension is definitely needed. How much longer will it take? Another 20 years or more?